We want you to feel comfortable throughout your whole journey. Special staff have been assigned for 1st class passengers at the train stations and on board the ICE trains, who are happy to look after and attend to each individual passenger. This includes at-seat service when ordering food and drink from our on-board menu, or when requesting the daily newspaper. On the ICE Sprinter, we also serve 1st class passengers a small snack and soft drinks (coffee, tea, mineral water, orange juice) free of charge at their seats. Before you plan your journey, be sure to stop by our 1st class/ bahn.comfort counter to receive the latest information on fares and timetables. We are happy to assist you with whatever your travel needs may be. Also take advantage of our new DB Lounges exclusively for 1st class customers in Berlin, Hamburg, Munich, Frankfurt and Cologne! Worried about the price? First class fares are extremely reasonable and worth every penny. 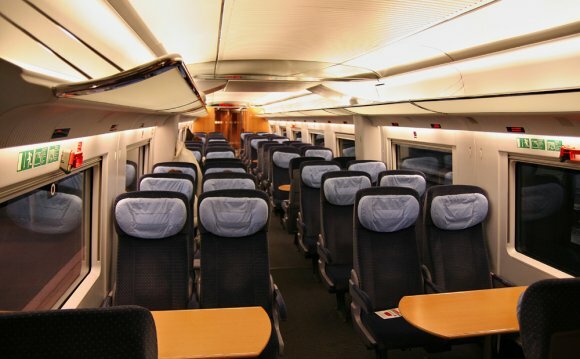 For example, travelling from London to Frankfurt 1st class starts at only EUR 109. Treat yourself to 1st class travel on your next journey with DB Bahnyou wont regret it! An InterCityExpress (ICE) train of Deutsche Bahn near Lonsee, in the Alb-Donau district of Baden-Wￃﾼrttemberg, Germany. An SBB Re 460 class electric locomotive leading the IC 2000. DBAG Class 411 and Class 415 are German tilting high-speed electric multiple-unit trains in service with Deutsche Bahn (DB), commonly known as ICE T.